WITH so much good food around, Easter can prove a challenging time for people to control their eating. Cookbook queen and food expert Annette Sym is doing her best to buck the weight gain trend by creating an Easter calorie counter. The counter is displayed in a table that measures the fat and sugar content of popular Easter treats and shows how long it will take to burn those calories. Mrs Sym said people would be horrified if they knew how long it would take to burn off just a few Easter treats. "To burn off 800 calories of Easter treats you will need to spend a full-hour running, kick boxing or doing high-impact aerobics." "My philosophy is if you do the crime, you have to do the time." Mrs Sym said some people see Easter as an opportunity to treat themselves. This can lead to feelings of guilt. "A lot of people binge on chocolate, feel guilty and then decide to give up on losing weight for good," she said. "Stop looking at Easter as an opportunity to give yourself a treat, and start treating yourself with respect instead. "People need to stay focused on their weight loss goals." Adults aren't the only ones affected by extra food intake and Mrs Sym urges parents to limit the amount of treats they give their children. 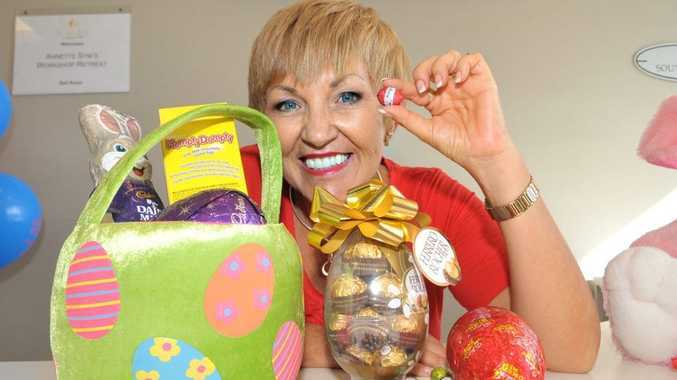 "People also need to think about the amount of chocolate they give their kids over Easter and the message it sends them," she said. "Parents need to scale it right back and give their kids just one chocolate treat. "If you're worried that's not enough, add a toy such as a cuddly bunny to their Easter basket." Cadbury 200g rabbit - 2½ hours to walk off. One packet of mini Malteser eggs - 1½ hours to walk off. 150g Heritage bilby - 1¾ hours. One Humpty Dumpty carton of small eggs - 1¾ hours to burn.